Western starring John Payne. 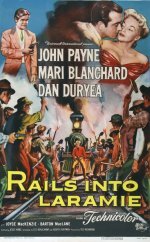 Army officer Jefferson Harder is sent to the town of Laramie to arrest a gang that is trying to prevent the completion of the new railway. But he finds that bringing them to justice is not as easy as he had first thought. This routine western is given a lift thanks to a snarling study in black-hearted villainy from the ever-reliable Dan Duryea, playing a character trying to stop the railroad reaching Laramie for his own devious purposes. Meanwhile, Mari Blanchard aims to rustle up an all-female jury to put Duryea away. All this would be interesting were it not for the presence of John Payne, past his prime and looking ill-at-ease as the dull hero. Never mind - the Technicolor's nice, and there's a throbbing theme song and a sullen Lee Van Cleef to remind us of High Noon. When it was shown in cinemas, this was released with Abbott and Costello Meet the Keystone Kops, and that really would be the best way to see it.